Group photo after the planting with dirty hands! 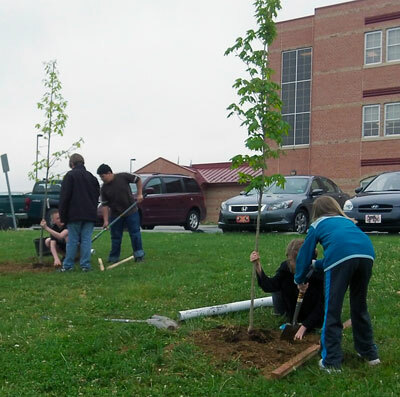 Wildwood Middle School was the recipient of a WV Project CommuniTree (CTree) kit to plant 12 shade trees that includes oaks, maples, poplars, sycamores, and gums. Carolyn Thomas, 8th grade science teacher, worked with her students to complete the application and organize the project. 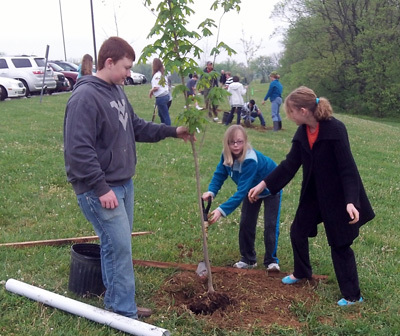 Around 20 middle school students and 2 FFA volunteers from the high school participated in the planting. 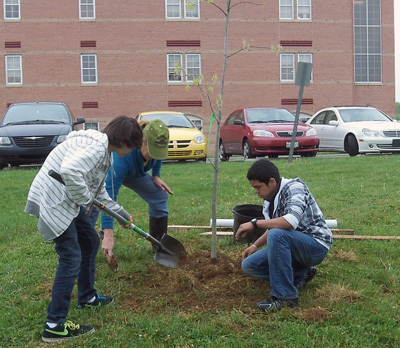 The students all learned how to properly plant a tree and the benefits of planting trees to increase urban tree canopy. 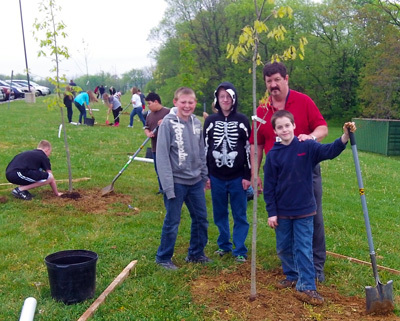 Mrs. Thomas and her students were assisted by CommuniTree Representative Tanner Haid from Cacapon Institute. The 12 shade trees provide the parking lot and buildings with shade and increase the value of the school grounds. As they grow they will increasingly reduce stormwater runoff and grow the school’s urban tree canopy. Working in groups to plant trees. Let me give you a hand! Mrs. Thomas working with her students. CI's Tanner Haid leading the group in discussion about the benefits of urban trees.